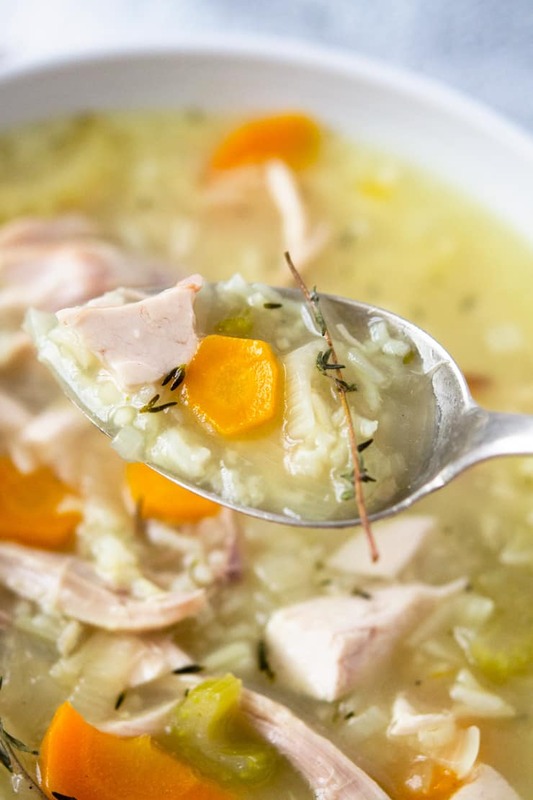 A healthy, wholesome and delicious rotisserie chicken and rice soup. This soup is perfect all year round and is extra comforting when you’re not feeling well. Made in only 20 minutes from start to finish, it couldn’t be easier to serve up a warm, healthy and easy meal when your pressed for time. Plus it’s gluten free! 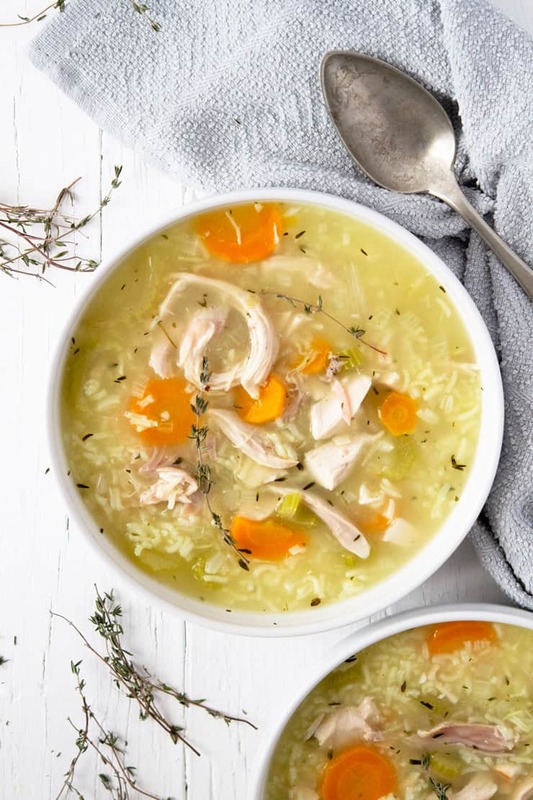 This 20 Minute Chicken and Rice Soup was a life saver last week when I was nursing my sick 3 year old, running between to doctor visits, and getting my oldest off to her first week of kindergarten (yes, we just started back!). Every mama knows – when a little one gets hit by a stomach bug, the whole household is affected. Cleaning, cooking, and sleeping go out the window, and are replaced by snuggling, movie watching, and extra laundry. Once my little buddy was finally on the mend, I wanted to make him some “real food” he could enjoy and that would be good for him too. I defrosted some homemade chicken broth from the freezer, and got out a few staple ingredients. My sweet mother-in-law delivered a rotisserie chicken from her grocery run and we were in business! 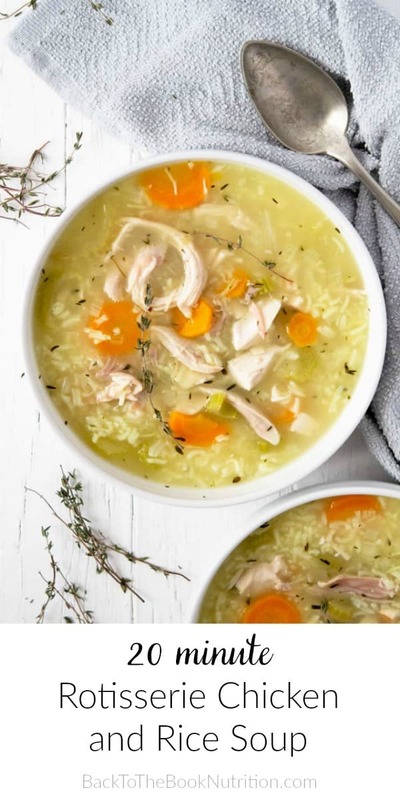 The keys to this fast and easy chicken and rice soup are the homemade chicken broth and the rotisserie chicken. If you’ve never made homemade broth before, check out my super simple method for Crock Pot chicken broth. It’s easier than you think, can be made ahead and frozen in pint-sized mason jars for quick defrosting, and makes a night-and-day difference in the flavor (and nutrition) of your soups! Rotisserie chickens aren’t something I normally buy but, without a pastured chicken from our local farmer in the fridge, and with limited time to spend in the kitchen, I was grateful for the quick and easy substitution that saved me at least 20 minutes! If you have the chicken and a little more time, by all means, go that route. 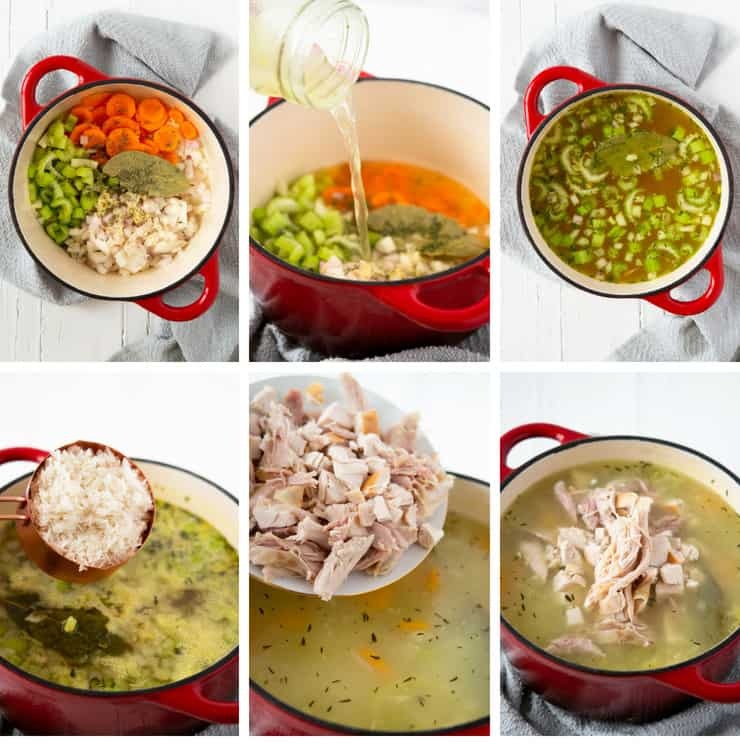 I love that this 20 Minute Rotisserie Chicken and Rice Soup is a simple, nourishing recipe when someone’s recovering from illness, but that it’s a recipe we can all enjoy! And it’s gluten free, which is important for more and more families these days. In fact, we had enough left over to share with friends who were having a rough week too. It’s such a blessing to make and share healthy, homemade food with others in need! Use homemade broth/stock it’s much more flavorful and makes a big difference to the end result of this soup. Plus there’s no nasty additives or added salt. Store you homemade broth in the freezer to make comforting and healthy soups whenever you need them. Rinse the rice under cold running water using a kitchen strainer before adding to the soup (unless stated otherwise on the packet). This removes the surface starch from the rice which stops the rice clumping together and going all sticky and gummy. Don’t have rice? Use noodles…any will do! This recipe calls for dried thyme but you can easily adapt it with other fresh or dried herbs such as parsley, rosemary or basil. You could even try a few red pepper flakes for a spicy kick. Once you’re done with the rotisserie chicken use it to make more broth (stock) for next time, no food waste and more yummy soup…win win! Place all ingredients except rice and chicken in a stock pot and bring to a low boil. (If your chopping veggies as you go, start the broth + water on high heat and chop in the order listed, tossing each into the pot as you go to speed things up a little). Add rice, reduce to a simmer, then cover and cook until rice is soft (12 minutes or so). 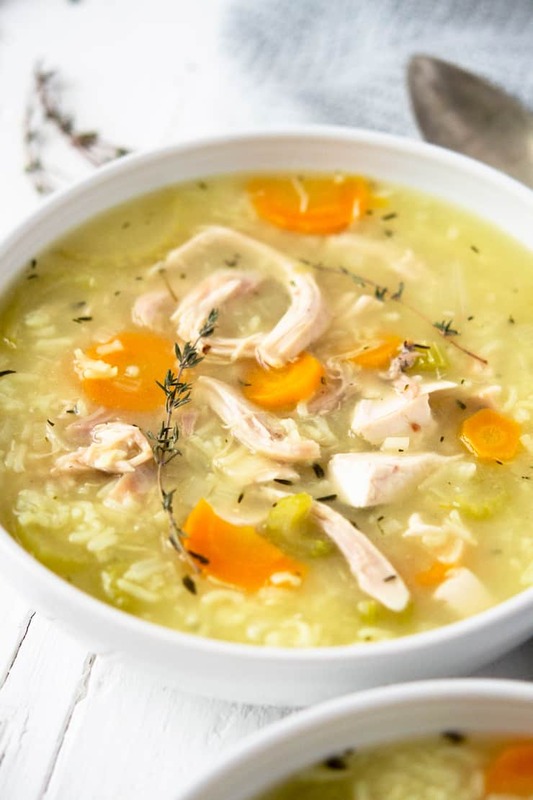 While rice is cooking, remove meat from rotisserie chicken and cut into bite size chunks. Once rice is cooked, add chicken to the pot and give it all a good stir. Heat for a couple more minutes until chicken is hot ans serve! Gluten free and ready in only 20 minutes, thanks to the rotisserie chicken and prepared broth! * I freeze my homemade broth in mason jars then defrost a few at a time as I need them: Remove lids and place frozen jars in a pot of water on the stove over medium low heat until broth is fully defrosted. Add rice, reduce to a simmer, then cover and cook until rice is soft (12 minutes or so). While rice is cooking, remove meat from rotisserie chicken and cut into bite size chunks. Once rice is cooked, add chicken to the pot and give it all a good stir. Heat for a couple more minutes until chicken is hot. Use homemade broth/stock it's much more flavorful and makes a big difference to the end result of this soup. Plus there's no nasty additives or added salt. Don't have rice? Use noodles...any will do! Once you're done with the rotisserie chicken use it to make more broth (stock) for next time. Don't have a rotisserie chicken? Follow the steps below. 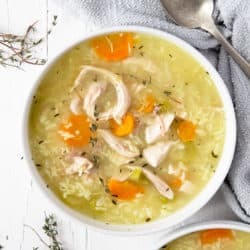 The beauty of this recipe is that it's super fast, yet still has all the rich flavor of traditional homemade chicken and rice soup. The key is using homemade broth, cooked low and slow for maximum flavor and nutrition. If you don't make your own broth, I'd suggest buying a whole chicken instead of the rotisserie chicken. Add it to the pot at the beginning of cooking, and cook thoroughly (approximately 30 minutes) before adding the rice. This will add some extra flavor to the soup and it should still only take 40-45 minutes to cook. I ONCE FOUND HOW TO CHOP N PUT TOMATOES IN MASON JARS THEN IN FREEZOR. I DID WHEN I WENT FOR ONE I FOUND THE JARS CRACKED.. HOW DO YOU PREVENT MASON JARS FROM CRACKING IN YOUR FREEZOR?? I’m wondering if you may have overfilled? When I freeze in jars, I only fill 2/3-3/4 of the way since the contents will expand when frozen and could cause the glass to crack. I hope that’s helpful! I freeze my chicken stock in ice cube trays and then store them In ziplocks until needed. I find one cube is equal to approximately a quarter cup of broth. Wow, this chicken soup looks very tasty! That sounds so flavorful! One of my favs. I can’t WAIT to try this! Thank you for this great recipe! So YUMMY! What a great looking soup. In fact we love using rotisserie chicken. What a great start to any meal. 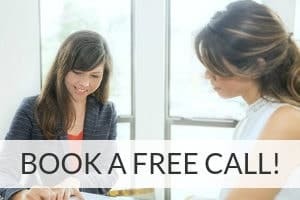 There are so many great recipes that you can use that chicken. I haven’t made chicken and rice soup in so long and yours looks like it would be a perfect bowl of goodness any time. This looks like comfort food for a cold winters days. I love soup in winter and this sounds so delicious. My kids would enjoy it. I don’t usually add rice in my soup – but I will try that soon. Yes, it’s one of my family’s favorite comfort food soups! 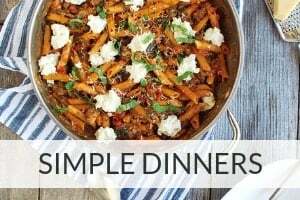 I’ve made this before and it was quick, easy and delicious. Question-I think will freeze pretty well but I’m wondering if I shouldn’t add the rice before freezing and just make that separately and add when reheating the soup? Thoughts?